Paul McGann is the Doctor in Embrace the Darkness. Audios dramas exist solely in one’s mind. The writer, director, and actors set the scene and play their parts, but it’s up to the listener to put all those pieces into place and create the scenario in their own head. Each listener will come up with a different setting. Each character will look different from one listener to the next. And even how each character goes about their actions will come across differently. The setting and players are the same, but exactly how everything unfolds will differ greatly; some might see it as a stage play, while some might see it as a more action-packed episode of television, or maybe even as a high-definition movie. So what happens, then, when you take an audio and set a good portion of it in absolute pitch black? Embrace the Darkness is a serial that tries something different; the antagonists of the piece are focused on hiding from the light and, as the title says, embrace the darkness. The cast give some great performances, including a fantastic turn by Ian Brooker as ROSM, but as the serial goes on, the script becomes rushed, leading to a rapid climax that doesn’t quite make sense and a “happy ending” that could have come straight out of a fairy tale, going against the mood of the entire production in the process. The Doctor doesn’t care one whit for the gaggle of Time Lord TARDIS’s that are hovering around the Time Vortex. He’s more interested in taking Charley to solve the mystery of the Cimmerian system. Millennia ago, the sun in the Cimmerian system suddenly went dark, leaving the entire solar system in a state of perpetual night. On the dead planet of Cimmeria IV, a group of miners are preparing the planet for exploitation. They’ve set up a system of energy emitters that will power the artificial suns in orbit, lighting the entire planet and allowing them to crack it open without worrying about harming the ecosystem. When they fire up the central unit, however, their base is attacked, and in a matter of moments, the three miners find themselves in utter darkness, unable to see in the complete absence of light. 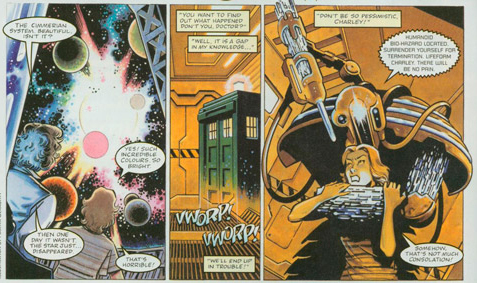 While the Doctor gets caught up in the rescue attempt being headed by the intelligent computer ROSM, Charley finds herself stranded in the mining facility. Face-to-face with the blinded miners, she realizes that it’s not because of the darkness that they cannot see; it’s because something has taken their eyes from their sockets. I don’t know if you can quite call Embrace the Darkness a “base under siege” episode. It’s more along the lines of a “get the hell out of the base” episode. The Cimmerians still exist. Small gray aliens that resemble children, the Cimmerians abhor the “taste of the light” and will do whatever they can to “embrace the darkness,” a phrase they hiss time and time again. The Cimmerians are a unique race in the annals of Doctor Who, and their purpose and history is nicely laid out through the runtime of the play, along with their reasoning for their hostile interactions with the crew of the mining facility. The script does Paul McGann justice as he gives a bit of a different Doctor in this serial. Split up from Charley due to the actions of ROSM, we see the clever, thinking-on-his feet Doctor as he runs logic laps around the computer. When he confronts the leader of blinded miners, Orllensa, he tries to motivate her though a mix of first humor, and then anger as she bitterly gives up, refusing to take what he terms a “Leap of Faith.” And, in the fourth episode, when he attempts to make a self-sacrifice because of previous actions, the gears shift and McGann becomes a true Shelley-esque figure; tragic, yet accepting of his fate. This story was written way before the concept of the Time War, but it’s very easy to see the seeds of Nine’s survivor’s guilt in Eight’s actions during the final act. Once again separated from the Doctor early on in Embrace the Darkness, India Fisher continues a strong run as the Doctor’s companion. While Embrace the Darkness is the “stand alone” story in Eight’s second season, as the other serials (Invaders from Mars, The Chimes of Midnight, Seasons of Fear, and the upcoming audios The Time of the Daleks and Neverland), there is still a small myth arc thread running through this serial, one detected by ROSM that declares Charley a threat. And she is a threat; she’s brave, willing to disobey the Doctor when need be, willing to lend a shoulder or ear if need be, and definitely willing to say “what the hell, Doctor” when the Doctor is about to do something incredibly against his nature. Where the Doctor will match wits with ROSM to save Charley from being killed, Charley will throw herself into uncertain danger to save the Doctor from himself. It’s a great friendship as shown time and time again. The supporting cast is a bit iffy. Nicola Bryce is the tough-as-nail Ollensa, leader of the blue-collar crew. Her emotional pendulum swings a bit too wide a bit too quickly; from firm-but-fair leader to bitter blind person to grateful rescuee to ready-to-fight captain, all at the behest of the situation rather that character development. It’s a shame, since there is a nice conversation between Charley and her regarding a traitor on a past work crew. Ferras, as played by Lee Moone, is the mix between comic relief and “oh God we’re all going to die” whining, while Mark McDonnell as Halliard plays the part of “crazy, but knows what is really going on.” The characterization of the three needed to be sanded down and reigned in a bit, as they covered too far of a range of emotions over the course of the entire audio. That said, the standout is Ian Brooker as ROSM, who commands the rescue ship and overall recovery operations. ROSM, in the course of trying to rescue the crew miners and follow safety protocols, doesn’t go the HAL 9000 route, but his attempts to follow the rules no matter what the cost both manage to solve problems and create new ones. You can hear the exasperation in the voices of the Doctor and Ollensa at ROSM drives them crazy and the joyous relief when they talk him into their way of thinking, and you can hear just how annoyed ROSM is getting at the Doctor even when the Time Lord is correct. Brooker walks a fine line with his performance and does a great job with it. The listener expects ROSM to go crazy at some points, but his sheer literalness is even more of a roadblock to the heroes. Normally, I’d praise the sound department for a job well done. But with Embrace the Darkness, the sound team decided that the noise of the Cimmerians attacking the miners, and subsequent reoccurrences of that noise, are incredibly loud and harsh on the listener’s ears. There’s little time to turn the volume down before it’s on you. It’s a rare misstep by Big Finish’s audio department. But the biggest drawback to this audio is the script. In my opinion, the play needed to have the final seven minutes chopped off and the ending reworked slightly. The play moves along with a variety of scenes and ideas, and manages to blend together horror and tension with just the right dose of dark humor. The first cliffhanger is one that actually made me put the headphones down and vow to listen to the rest of it in broad daylight! But the audio puts its foot on the gas pedal and accelerates a bit too quickly from that point on, glossing over some interesting concepts while spending a bit too much time on others. As the audio rushes towards the finale, things happen VERY quickly, so much so that is seems to turn into a case of “oh, that needs to go in, that needs to go on, OH DEAR, THAT NEEDS TO GO IN TOO!” The climax of Embrace the Darkness is the biggest offender. A completely unnecessary “chase/race” scene occurs, and when the opponents are revealed, listeners will stop and go “wait, what’s with all the weapons fire then? Why would they open fire?” And when that’s followed by a 1970’s sitcom “everybody laughs” style denouement, it’s the final stamp on what started out as a tense crawl through the darkness, only to end up a play that falls short, even if it wasn’t being held up to the others in Eight’s second season. This entry was posted in Big Finish Review and tagged Big Finish, Charley Pollard, Doctor Who, Eighth Doctor, paul mcgann, TARDIS. Bookmark the permalink. I actually quite enjoyed this one. I don’t know if I’d give it more than 3 stars… maybe 3-1/2, but I liked it better than most of the myth stories surrounding it.